We review Ulm, the city building board game from R & R games. 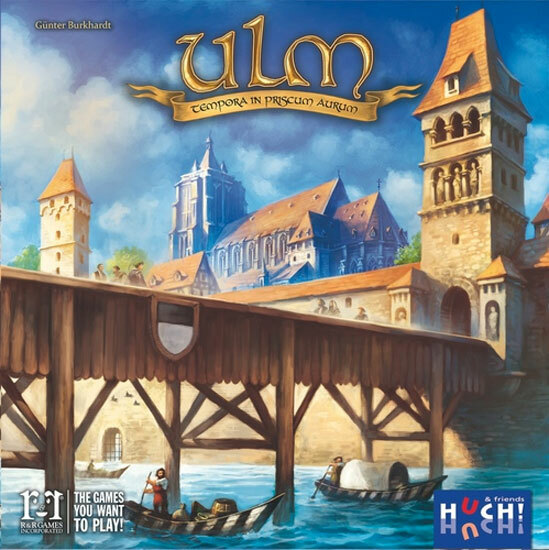 In this set collection and resource management Euro game, players are attempting to build up the prominence of the city of Ulm through various actions and landmarks. The previous text is a quote from the official Ulm Tourism website. Gamers firmly interested in a quick visit to a European city that rose to prominence after the Renaissance and subsequently declined in the Age of Enlightenment following the 30 Years War will be overjoyed. Other gamers might be wondering what does this have to do with anything? Ulm is an action selection, resource management, and set collection game for 2-4 players that takes about 60 minutes to play. It plays best with 3 or 4 players. 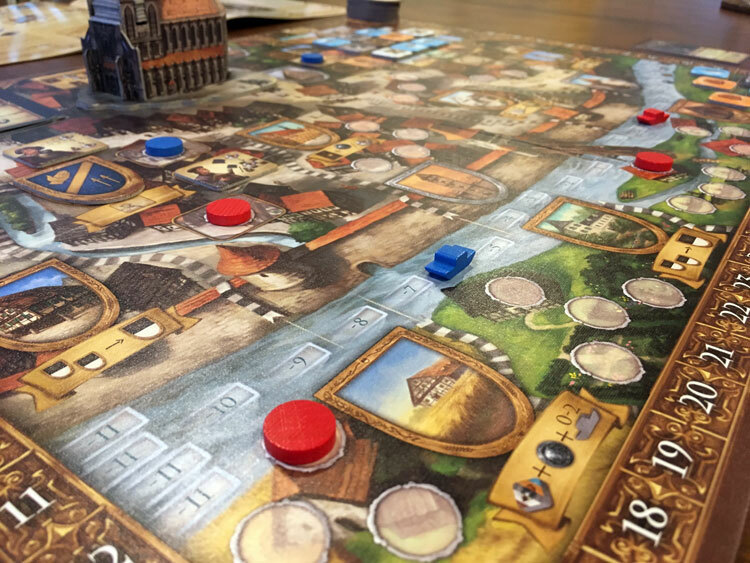 As nobles in the city of Ulm, Germany, the players are attempting to build up the prominence of their city through exploring the opportunities of the various landmarks. Actions are taken using the city’s cathedral, which presents a puzzle of tokens. The most victory points at the end of the game wins. 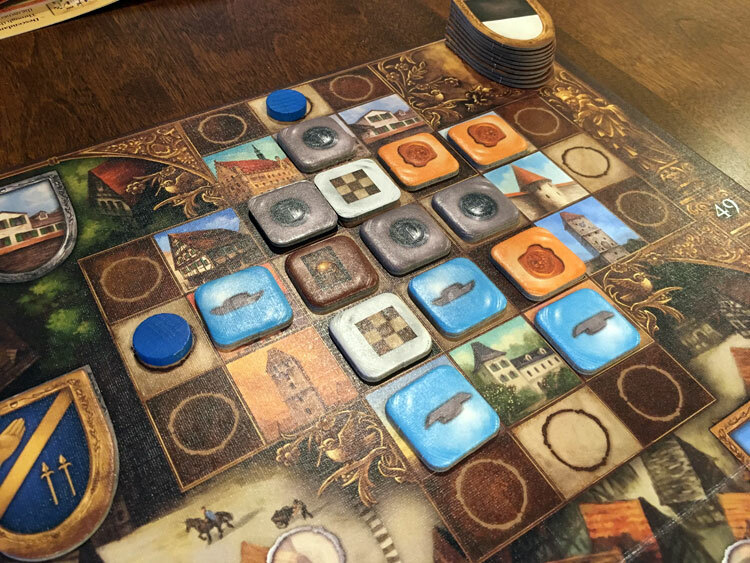 The cathedral of Ulm sits majestically on the board holding the round tokens. The bits that accompany the game (cloth bag, cardboard action, money, sparrow tokens, wooden discs and boats, cardboard shields, deck of cards) are fine, but two stand out specifically. The game board is gorgeous, magnificently displaying the grandeur of Ulm and the historic locations. 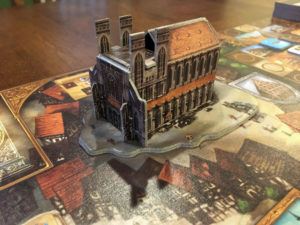 Additionally, the cardboard cathedral, which acts as little more than a holder for the round tokens, is majestic if somewhat clumsily assembled (Hint: transparent tape on the inside is needed to hold it together). The rules come in two books, both multilingual. The first is a straightforward reading of the rules with very little flavor. The second, labeled the “Chronicle of Ulm” is an explanatory document for the various icons in the game and how the components work with each other. The Chronicle also contains considerable flavor regarding the history and locations in Ulm and how some of the components represent the theme. After a very simple setup, players will take single turns each round. With every new round, a token is added to the top of the cathedral to keep track towards the game end of 10 rounds. All the action tokens are thrown in a bag save for the ones from setup. On your turn the token you have selected is pushed into the cathedral grid. Seal: Pay 2 coins to take advantage of a building that is adjacent to the river section you’re on. Clear-Away: Collect one of the pushed-out action tiles from the cathedral. Each of these can be enhanced by various game effects, but the main sources of points in the game come from using seal actions, gaining points from collecting sets of cards, and getting your boat as far as you can along the river. There’s a tremendous amount of nuance in each of the game’s actions; and the activities and upgrades involved with using the seal action are numerous. Readers wishing to learn more can take a look at the Ulm Chronicle. Adventurous players can use a game mode where each round’s token has a special effect for all players during the round. In either case, after 10 rounds, the game ends. The river is a track for boats which grants access to additional shield spaces along the way. When parents drag their kids around a grand historic locale, a place steeped in history, but not much fun, the kids shouldn’t be blamed for not remembering it. Ulm’s mechanisms and strategy are interesting, but much like kids on a trip to the Museum of Medieval Basket Weaving, some players will struggle to remember it. 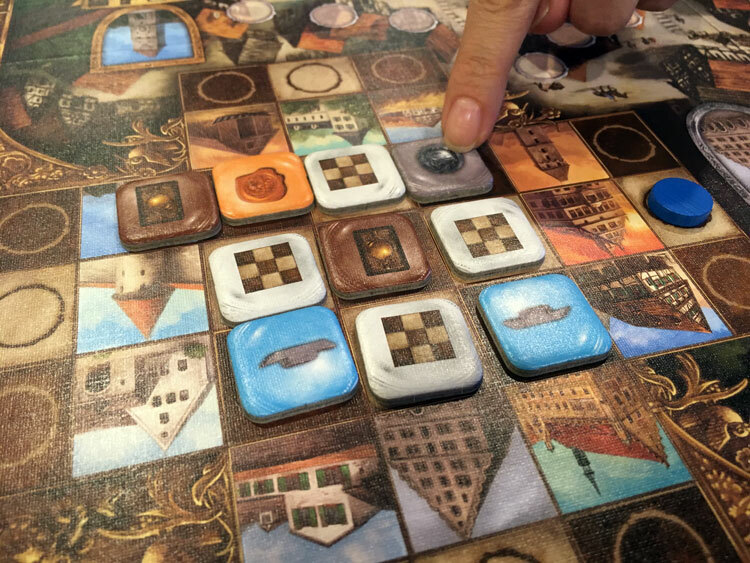 Players who have played Bruges, Bruxelles 1893, Strasbourg, Istanbul, Burano, Roma, Macao, Rialto, Saint Malo, London, Madeira, Firenze, and others will start to see the pattern. It’s hard for any game with Euro style to get traction in the market with this many games that have come before. Ulm has it’s own thing. It has it’s own mechanisms, but without something stellar to break through, it will not be what it wants to be. Cards in the game will grant immediate bonuses or offer points at the end of the game. The main aspect of play that is immediately noticeable is the amount of randomness in the game, all of which have mechanisms to be mitigated, but at a high price. The action tile pulled from the bag is random. The grid of cathedral actions, after a couple of turns from opponents, won’t be in the state it was in before. The card draws, despite duplicates in the deck, are also random. Controlling all of this is a central theme of the game by getting in a position to make choices, but the degree to which players can make the most of those moments is simply not enough. There is still an element of chance at play which some gamers will find annoying. Where Ulm does breathe fresh air on this space is in play time and interesting action choices. 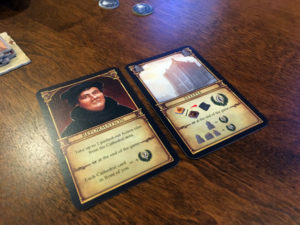 Much of the time of the game will come from players analyzing the cathedral grid to get just the right selection of actions. The more action tiles that clog up the grid, the shorter the time needed to analyze because certain choices are not available. This, along with strategizing how to get certain game elements to work for you, is truly engaging and can easily get high marks from puzzle fans. Even though the theme of Ulm may feel like a walk through a history museum, the production does a great job of engaging with the theme. Actions, cards, and the use of the river actions in concert with the seal actions elicit interesting choices. The included Chronicle, for those who dare read it and let some flavor into their Euro style games, is well done and interesting. As tokens are pushed out of the cathedral grid, players can pick them up for other game effects. Ulm is a fine game. It has the classic feeling of a Euro style game with a tad more randomness than is usual thrown in. 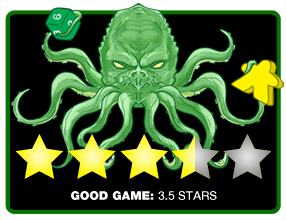 It’s a great game for new gamers looking for a step up to more advanced Euro style games. It has just the right integration of theme. Unfortunately, Ulm arrives on the scene well after many other (sometimes better) games with their own interesting mechanisms and their own city theme have come and gone. This makes for a game that doesn’t tread enough new territory or enough depth to make it memorable, but for players who have never experienced these choices, it could definitely be a hit. If Ulm had been presented five years ago, it would deserve higher praise. It’s engaging, gorgeous, and doesn’t overstay it’s welcome, but randomness and sameness keeps it from being an amazing experience. Only those who have never experienced a city-based Euro should feel a need to visit. 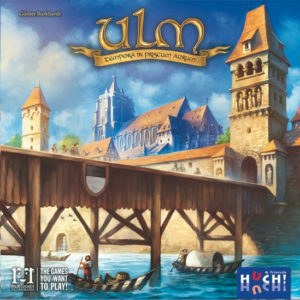 If you’d like to pick up a copy of Ulm, you can get it for about $40. Final Score: 3.5 Stars – While Ulm does a lot of things right, it struggles to set itself apart in an already crowded genre. I truly appreciate the tremendous amount of information, etc., you’ve given in this review. It has really helped me to feel as if I know the game and whether I’d like to get a copy. Great review! Your comments are very much appreciated Gary. TI love to hear any feedback that can help me improve my reviews.